Want to Read More about 3-Card Poker? Do you remember what happened in 1994? Brazil won the FIFA World Cup for the fourth time, the US approved and sold the world’s first genetically engineered tomato, and Kurt Cobain decided that it was better to burn out than to fade away. Except for that one guy who came up with a Poker variant that, soon after, would become a true Casino classic. Yes, 1994 marks the invention of Three-Card Poker, one of the greatest Casino thrills of all time, devised and patented by a Britain-born brave man named Derek Webb. If it wasn’t for him, this nearly uneventful year would have gone unnoticed. And if it wasn’t for Webb, the Poker community would not be playing an exciting card game nowadays. This is the stirring tale of how 3-Card Poker came to be – and how to play it like a pro. Time to practice what you've learned! Play the best Three-Card Poker games for free and beat the House at Poker! He wanted to create a game that combined the excitement of Poker with the speed of regular Casino games. Three-Card Poker rules, however, were mainly a contemporary version of older games, the first one invented by Webb’s fellow countrymen in the 16th century, and the other born and bred on the Mississippi and Ohio Rivers some three hundred years later. You know them as 3-Card Brag and Poker. Before the tipping point of 1994, Derek Webb had tried his luck in both of these games. He described his early Las Vegas experience as “slow and boring”, tempting him to reimagine the existing poker-based games and give them a much-needed revamp. What was initially 3-Card Brag soon evolved into Brit-Brag and Casino Brag, only to be made yet simpler and more straightforward with 3-Card Poker. It wasn’t until Webb took it overseas that the game received its now recognizable name. Rejected by the Brits, 3-Card Poker was first adopted by Vice President of the Grand Casino Gulfport in Mississippi. Or this is how the story goes, at least. Years later, the Brits changed their regulations on UK Casinos to allow the introduction of Webb’s game. Today, Webb’s creation goes by the names of 3-Card Poker, Tri Poker, Tri Card Poker, Trey Card Poker, Triple Edge Poker, High-Speed Poker, Fast Poker, Trey Poker and Poker Three, and is played everywhere in the world and at all the best Live Casinos online. 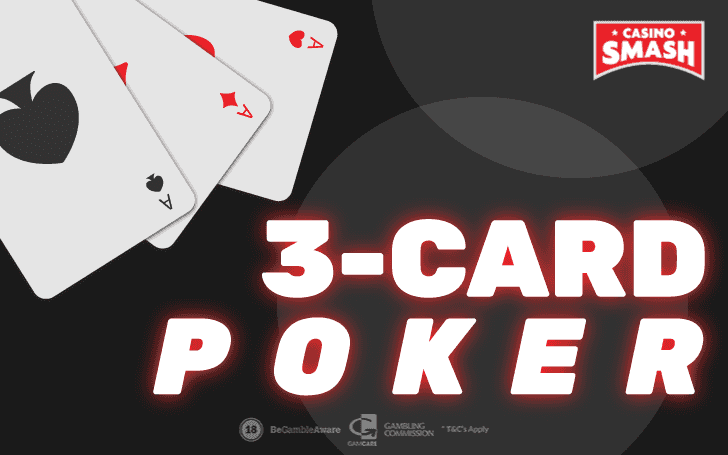 Don’t let the different names fool you – 3 Card Poker has a set of clearly established rules that apply to all tables regardless of where they are or how they choose to call it. Three Card Poker may seem like two games in one, but it’s still a very simple casino game to understand, learn, and play. It’s why this game is so widely popular, after all. You can play against the dealer and win. You can have good cards and also win. Either way, you need three of them for the best poker hand. But let’s take it slowly and try to savor every card. The modern Casino version of 3-Card Poker is played with a 52-card pack on a special table. There, three cards that are dealt to each player, including the dealer. The cards are face down, meaning they are not seen by anyone else at the table except for the person they’ve been dealt to. 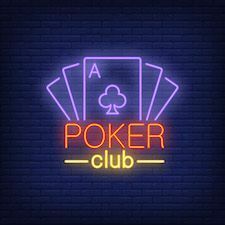 3 Card Poker is typically described as two Casino games in one because there are two types of bets each player can place – Ante and Play, and then Pair Plus wagers. With the Ante wager, you’re betting against the dealer to see who has the highest Poker hand. Then, you need to make a Play wager if you don’t want to fold your hands after checking them out. Play wager is equal to the Ante bet. Choosing Pair Plus wager, you’ll be betting directly on your cards, circumventing the dealer’s hand. The bet choice, however, is not entirely up to you. In most Casinos, every 3-Card Poker player must first place and Ante and Play bets; that’s the only way of receiving cards. It’s only then that you’re allowed to place an additional Pair Plus bet. The High Card hand consists of – surprise, surprise– three cards of different ranks. They must not all be the same suit, nor can they be consecutive. If on the off chance the middle cards are equal as well, the lowest cards outweigh. If sets of two were to determine the quality of player’s hand, the game wouldn’t be called Three Card Poker. The Pair thus includes two cards that should be of equal rank, plus another one of a different rank – the odd card called the kicker. It’s still the rank of the pair that decides the winning hand, except in a scenario where two pairs are equal. The winner is then the hand that boasts a better kicker card. If you’re dealt three cards of the same suit, you have a Flush. Two hands with a flush are compared by the highest cards, then the middle cards if the highest ones are equal, and finally the lowest cards if the middle ones cannot decide the winner. The rules are the same as those for the High Card hands. The Straight hand is the one with three cards of different suits that are consecutive. 3-2-A is the lowest type of Straight, for example, and A-K-Q is the highest. 2-A-K is not a Straight at all. You’ve received three cards of the same rank? Congratulations, you now have Three of a Kind. Dare to guess which of the two hands win? That’s right, the higher ranked cards top the lower ranked ones. While you need three cards of the same suit for a Flush, the Straight Flush requires three consecutive cards of the same suit. Need to compare two Straight Flush hands? Follow the rules for Straight hands. The only additional rule you must be aware of is that 3 Card Poker allows no ranking among suits. If it happens that you have the same combination and equally ranked cards (be they high or low) as the opposite player, you can call it a tie regardless of whether the cards you two have are different in suit or not. Now that you know how 3-Card Poker hands are ranked, you’re ready to receive your first cards. In the case of beginner’s luck, the winnings are unfortunately unreal too. Pick your place at the table and place your first Ante bet. You’ll see three cards coming your way and three more for each player, including the dealer. Take a sneak peek at your cards and try not to reveal them to others. 3-Card Poker offers two options now, and you need to decide depending on the quality of your hand. The second option is to fold and lose the Ante bet. Take your time, but don’t waste others’. If the dealer doesn’t have a Queen high or better, you’ll be paid even money for your Ante bet while your Play bet will be returned. If the dealer does have a Queen high or better, you’ll be paid even money for both the Ante bet and the Play bet. For this to happen, though, your hand must beat the dealer’s hand. In case the dealer has a Queen high or better, but your hands are equal, both your Ante bet and your Play bet will be returned. And finally, if the dealer does have a Queen high or better, but your hand is worse than theirs, you’ll, unfortunately, lose both the Ante bet and the Play bet. If you hold a Straight or better, you have a chance for one extra bonus. 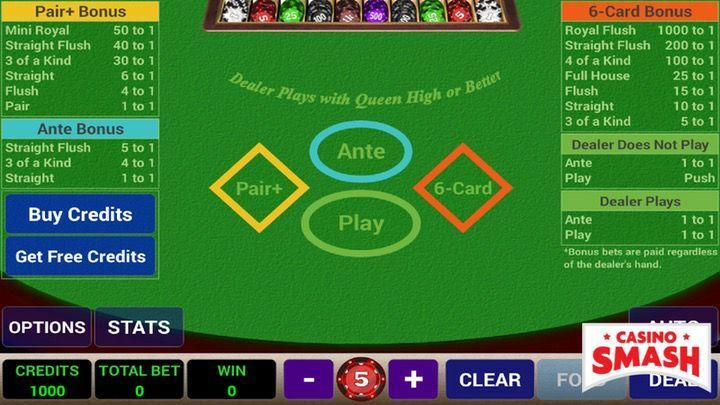 The Ante Bonus is paid to the Ante bet for a straight or better, regardless of whether the dealer has a Queen high or better or not and regardless of whose hand is superior during the ultimate showdown. Collecting trivia along with Poker hands? Even though Pair Plus has been a part of the 3 Card Poker gameplay since its origins back in the mid-1990s, it wasn’t until 2012 that it was officially registered as a trademark of SHFL Entertainment, Inc.
And now for the actual Pair Plus rules. As mentioned before, this 3 Card Poker bet is always optional. 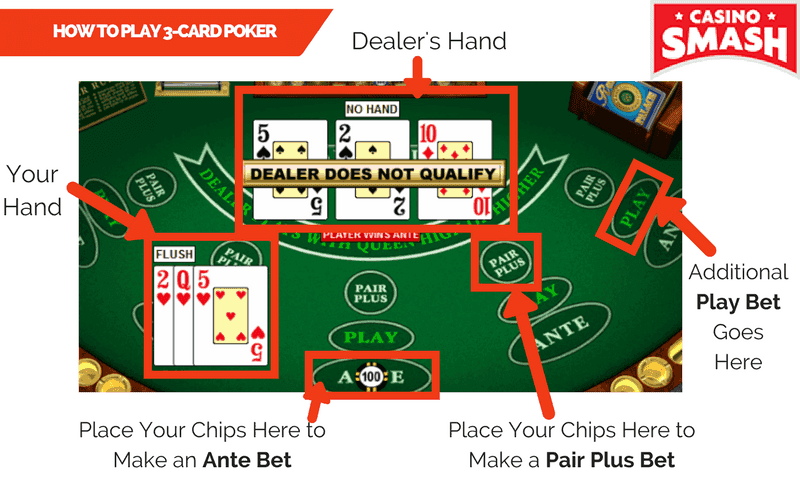 Unlike the Ante bet, the Pair Plus never depends on the quality of the dealer’s hand. 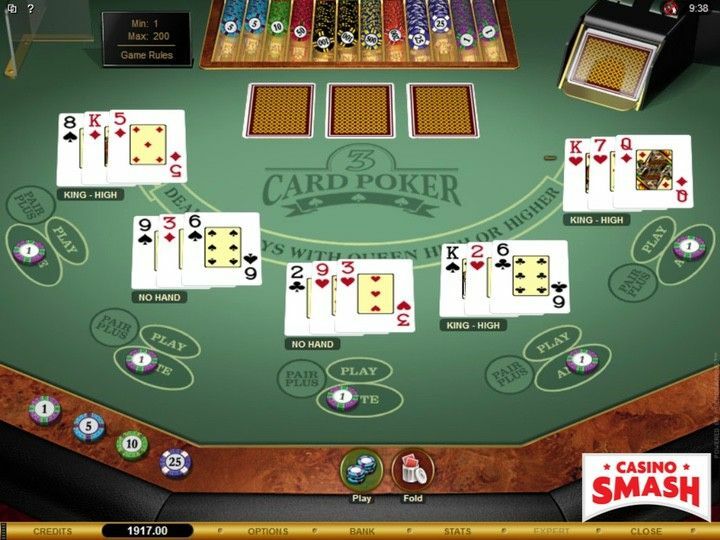 Every Poker-based Casino game has its optimal strategy, and 3 Card Poker is no exception. The only thing that makes it different from other similar games is the fact that for Webb’s game you don’t need to strategize as much. Like the rules themselves, the optimal strategy for 3 Card Poker is no sweat. Simply make the Play bet once you hold Queen-6-4 or better. Alternatively, Queen high or better might do the trick, too. Make your Ante and Pair Plus bets equal, or make one of them double the amount of the other. In case you’re a complete beginner, please beware that no strategy can ever be good enough to beat the house edge. It’s nothing personal, simply the way these games are designed. And, that’s how to play 3 Card Poker in a Casino. The secret formula to winning at 3-Card Poker might not exist, but its rules are still among the easiest in the book. If everything’s clearer now, it’s time to return to the beginning and start over. From the long-gone card games of 1994 to the still-fresh Casino thrills of today, 3-Card Poker has remained one of the simplest, fastest, and most exciting chapters in the history of Poker. Join it today to add a line or two of your own. Right now, this online Casino is the best site to practice Three-Card Poker online. 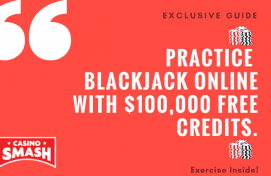 The 3-Card Poker action online is beyond exciting and the great payout structure of this game can turn your real money games into really explosive wins. Gonzo’s Quest Slot Review: What Makes It So Popular?